Welcome to the Berkeley High School theater information page ~ Beta Version. This page is designed to give visitors some basic information about the theater spaces, how to make a rental inquiry or book an event in one of the theaters, and give a brief overview of the guidelines for usage. 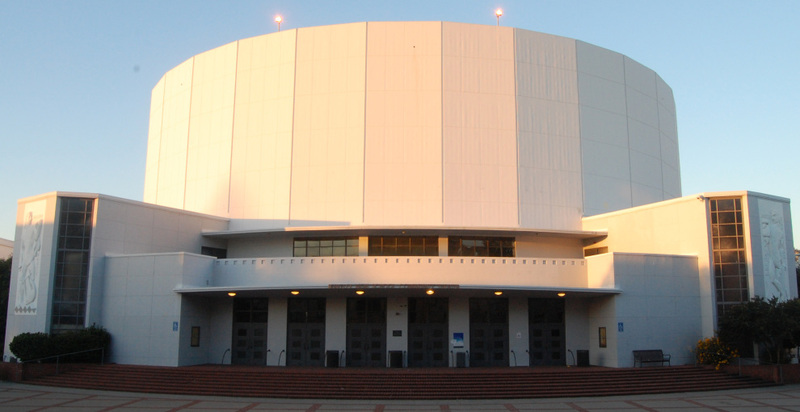 Berkeley High School is home to two theaters: the 3500 seat BERKELEY COMMUNITY THEATER and the 575 seat FLORENCE SCHWIMLEY LITTLE THEATER. The theaters are maintained and operated by the Berkeley Unified School District and host many events for Berkeley High School and other schools around the District. Construction on the Berkeley Community Theater began in the 1940s, but was suspended for several years during World War II. After a 9 year hiatus , construction resumed and the theater was dedicated June 5th, 1950. During its heyday in the 1960s and 70s, BCT hosted some of the biggest names in Rock & Roll, Jazz and R&B, as well as many singer/songwriters of the day. Among the notable performers to grace its stage were the Grateful Dead, Led Zeppelin, Little Richard, Bob Dylan, The Doors, Joan Baez, The Who, Johnny Otis, Lou Reed, James Taylor, Carol King, Ike & Tina Turner, Van Morrison, Joni Mitchell, Peter, Paul & Mary, The Byrds, Bette Midler, Simon & Garfunkel, Joan Armatrading, and Jimi Hendrix in his last U.S. appearance. The list is extensive and reads like a who’s who of music royalty. The theater also saw significant use through the 1980s and 90s with performers like Bruce Springsteen, Bonnie Raitt, Cyndi Lauper, Huey Lewis, Elton John, Styx, Laurie Anderson, Dave Matthews Band, Santana, Lenny Kravitz, Cheech & Chong, Foo Fighters & Jewell making stops here. The reputation of the Berkeley Community Theater as a world class music venue was well known. The theater also houses the second largest Wurlitzer pipe organ in the U.S. For more info on the mighty Wurlitzer, please visit the NorCal Theater Organ Society website, www.norcaltos.org. Musicians are not, by any means, the only groups to grace our stage. Authors, activists, counter-culturists & beat poets like Allen Ginsberg, Paul Krassner, Ed Sanders, Timothy Leary and Lawrence Ferlinghetti also made appearances during the tumultuous 60s, contributing to the storied past of the venue. The Berkeley Community Theater has even hosted His Holiness, the Dalai Lama. Many original details and features of this World War II era building still exist, and some have been upgraded. More upgrades and modernizations are in store for both spaces, but bringing the theaters’ aging systems up to today’s technological and user standards presents many unique and complex challenges. Several improvements have taken place over the past few years including upgrades to the lighting and sound systems in both spaces. New lighting fixtures, new lighting and sound consoles and a modern speaker array are among the highlights of the more recent renovations in the Community Theater, while the Little Theater has seen its theatrical dimming system completely overhauled. Still, the theaters are showing their age, both functionally and aesthetically. But the generosity and spirit of the residents of Berkeley, along with some notable alumni, has provided some much needed funding to help usher these beautiful spaces into the 21st century, and back into the lexicon of Berkeley’s premier public performance spaces. Check back for updates on future plans!